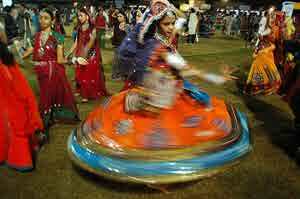 The colourful Navratri festival is celebrated in India for nine nights around the beginning of October, although as the dates of the festival are determined according to the lunar calendar, the festival is a moveable feast. Navaratri in 2011 begins on Wednesday September 28th and continues for 9 days until Thursday, October 6th. The Navratri commences on the first day (pratipada) of the bright fortnight of the lunar month of Ashwin. Navratri is a traditional Hindu festival celebrated with love and devotion across India and in Indian communities all over the world. The mood of Navratri is very colourful, incorporating veneration of the goddess with commemoration through song and dance. Navratri actually means "Nine Nights" (nav meaning nine and ratri meaning nights). 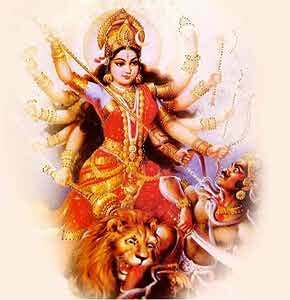 The nine nights are devoted to the reverence of Goddess Durga (Mā Durga), who is believed to exist in many forms as the manifestation of the absolute energy that pervades the Universe. During these days and nights prayers are offered to the Mother Goddess. For the devout these days are sacrosanct, for it is during this time that the Goddess reviews her devotees, granting her blessings, removing ills and evils and ensuring an unproblematic life for the faithful. Navratri in September/October – called the Sharadha Navratri is the more famous one as it is intended for householders. In 2011 the Navratri poojas (rituals) start on Wednesday, the 28th of September and continue for 9 days until Thursday, the 6th of October. Navratri in the March/April period is called Vasantha Navratri which is good for attaining success in endeavours. Lord Rama celebrated this to attain the spiritual power to accomplish His Incarnation purpose – that of slaying the demon-king Ravana. 28 September 2011 – Navratri, Festival of the Nine Nights begins. Each of Navratri's nine nights is dedicated to one form of the Goddess Durga. In other words, every ratri of the Navratri corresponds to the worship of a different form of Mā Durga. Mata Sidhidārti, who is a treasure house of Mystic Powers (Yantra Tantra) and Knowledge (Gyāna). Some may also say that the nine days are divided and devoted to the Trinity of God worshipped in a female form, so for three days Mā Durga (Goddess of Valor) is worshipped; for three days Mā Lakshmi (Goddess of Wealth) is worshipped and lastly three days are devoted to Mā Saraswati (Goddess of Knowledge and Art). On the fifth day, that is, Lalita Panchami, books are gathered, and a lamp is lit to invoke Saraswati. The eighth and ninth day, Yagna (a sacrifice offered to the fire) is performed to honour the heavenly Goddess and bid her farewell. Navratri also allows for the recitation of sacred scriptures, such as Durga Sapshudi from Markandaya Purana. This narrates how Goddess Durga was blessed and provided with weapons by our Trinity of Gods (Brahma, Vishnu and Shiva) to annihilate Maheshasura, the mighty demon who had forced the Gods to leave heaven and take refuge on earth. Musical recitations (Kirtans) by famous musicians are offered during this phase for the benefit of the Goddess and her devotees. This concludes the article. Read more at TruthStar.